Soon after his arrival in the US for the first time, in the spring of 1920, Carpentier got down to the business he had come to do, namely to star in a movie. The boxer, who had already starred in a highly fictionalized and melodramatic cinematic rendition of his life story in France in 1911 (Le Roman de Georges Carpentier), was driven by a chauffeur every morning from his Manhattan hotel to the New Jersey studios of Robertson-Cole, where the film was being shot. The film presents a version of Carpentier that is at once dashing and courageous and upstanding and patriotic. While the character is ostensibly fictional, spectators are clearly being encouraged to identify the actor/boxer with the role he is playing. Carpentier plays the title role in The Wonder Man (directed by John G. Adolfi), a role that is, as he says in an autobiography, “particularly flattering for [him].” Henri d’Alour  is a young officer assigned to the French delegation in the United States and, unbeknownst to his American friends, charged with uncovering an espionage ring. As it happens, his rival in love, an American engineer named Allan Gardner (played by Robert Barrett), is also his adversary in the espionage wars: Gardner is himself working undercover and has even committed a murder to further his goals. Gardner manipulates the situation so that d’Alour becomes the suspect in the murder. Ultimately, the French hero is able to produce conclusive proof of the American villain’s culpability. All ends well and d’Alour walks away with the girl, too. Improbably, but inevitably (movies starring boxers rarely pass up the opportunity for a fight scene or two, however gratuitous, and this one is no exception), d’Alour and Gardner are opponents in the ring as well. After a first encounter in which Gardner humiliates the inexperienced d’Alour in a supposedly friendly sparring match, the two end up squaring off in an amateur boxing tournament sponsored by the tony “Potomac Ridge Club.” In a scenario that will be repeated in countless subsequent boxing movies for decades to come, the hero/underdog d’Alour is badly outclassed for the first three rounds but, upon receipt between Rounds 3 and 4 of a note of encouragement from the woman he loves, draws upon previously untapped reserves of strength and skill. In a miraculous fourth round, the hero KO’s his dastardly foe and then displays his class and good sportsmanship by carrying the man back to his corner. The Wonder Man puts into play many of the most important elements of the iconic Carpentier persona. The wondrous man is first and foremost a gentleman (while American audiences may not have been aware of it, the lower-case “d” that precedes the character’s surname is a particule, an onomastic signifier of aristocratic status). Rather than being cast as a professional boxer, which would do nothing to enhance his image or create interest in him-- a professional boxer playing a professional boxer is not necessarily terribly intriguing--, Carpentier is cast as an elegant diplomat. He boxes thus not as a professional, nor even an official amateur, but within the context of a private gentlemen’s club, in what would today be known as a “white collar” bout. The entire story, in both its boxing and espionage sub-plots, takes place within a rarified world; tellingly, the advertisements for the film billed it as “an absorbing drama of high society;” “ a modern society drama with a thrilling four-round fight,” and “An Absorbing American Society Drama.” Among other things, the film thus reaffirms Carpentier as the gentleman boxer, the embodiment of the fascinating and improbable overlap between upper-crust society and boxing. In boxing terms, the fact that his character is an inexperienced and unskilled pugilist only serves to heighten the moviegoer’s thrill when, in the end, he manages to trounce his more qualified opponent. The suspense of the fictional boxing storyline is that of the uncertainty about whether the slim, handsome, dashing hero, however worthy, will be able to triumph in the ring over a more skilled, more vicious villain. This fictional suspense is of course precisely the suspense that would be created by the real Carpentier-Dempsey bout the following year; for fans who had seen The Wonder Man, the buildup to Carpentier-Dempsey must have had more than a touch of déjà vu. As would also be the case in the Carpentier-Dempsey matchup, the contrast between upstanding French hero and scheming American villain is between selfless patriot and selfish anti-patriot. According to at least one account, Carpentier’s character, Henri d’Alour, appears throughout the film in his French uniform, complete with medals (whether Carpentier wore his actual uniform and/or actual medals is unknown). Fight and film fans alike are going to take to George Carpentier in pictures. The former may never lamp him in action against a formidable opponent during his stay in America, but both clans can get an eye full of his wonderful athletic versatility in addition to his artistry as a screen actor in The Wonder Man. Carpentier, as Henri d’Alour, clad in his French uniform, upon which dangle the many medals he received, makes a handsome appearance. His smile and pretty teeth and altogether clean-cut appearance makes you wish you could shake his hand. These things, in conjunction with the heroic deeds of his fictional alter ego, will contribute to the construction of an iconic Carpentier persona in the collective consciousness of mainstream America. Given the big-scale publicity campaign promoting the film and its consequent commercial success (Carpentier’s autobiographies report that the film “made a lot of money for its producers” and that he himself made $45,000 for his twenty-five days’ worth of work), it is indeed probable that the film played a significant role in the marketing of the Carpentier as “the most magnetic man in the world” to the American public. The Wonder Man also produced some of the mostly widely distributed still photographs of Carpentier. In what appears to have been a single sitting, Carpentier was photographed bare-chested, in form-fitting white boxing trunks with a tri-color sash at the waist, in multiple, stylized, quasi-sculptural poses designed to highlight his impressive physique: in profile, slightly raised on his toes, with right arm extended and left cocked up by his shoulder and vice-versa, in fighting stance with head down and one or the other biceps flexed, and so on. Reproduced on postcards and collectors’ cards, in his own books and often accompanying the flood of newspaper and magazine articles about him that would appear in the year between the first release of the film and his fight with Dempsey, these images show the “wonder man” Carpentier as statue, as super model, as male pinup. Even those who hadn’t seen the movie had a chance to admire the French boxer’s “Greek God” physique through the circulation of this particular set of images. 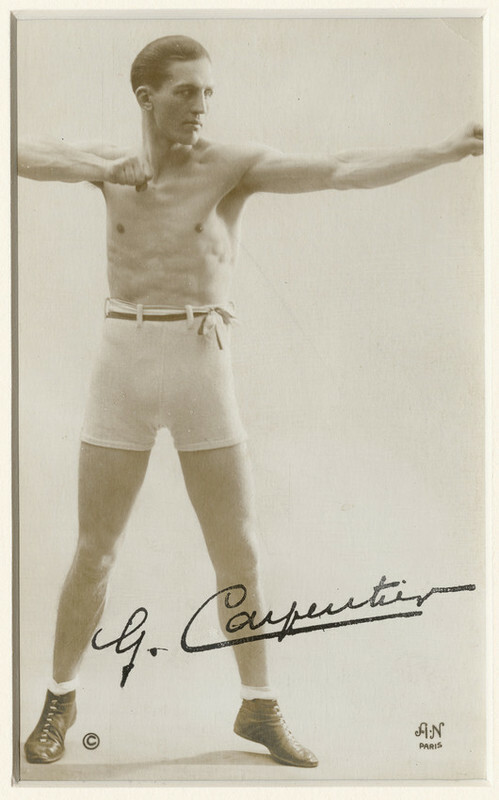 In an interesting example of the sort of blurring of lines between fact and fiction, between sport and spectacle, that was an integral component of Carpentier’s career, Nat Fleischer made the revealing error, in his biography of Dempsey, of mistaking the Wonder Man stills for pictures of Carpentier in training for the Dempsey bout in Manhasset, New York. His captions reads: “First fighting poses of Georges Carpentier at Manhasset Bay camp.” The Wonder Man pictures were indeed the first US-produced pictures of Carpentier is fighting poses, but they were taken at a time when the only fighting he was doing was fictional. They are “real,” in that they do what they purport to do, to show Carpentier’s body, but they are artifacts from a film set, not from a training camp. Ultimately, The Wonder Man accomplished the simple but all-important goal Carpentier and Descamps (who plays a minor role in the film himself) had in mind when they agreed to make the film: to introduce Carpentier to a mainstream American public that had previously had very little knowledge of him. The plan very nearly backfired, however, as American fight fans were quick to dismiss the “film boxer,” to pigeonhole Carpentier as a movie actor who also boxed rather than a boxer who had appeared in a movie or two.